I am indebted to one of my students for the discovery that there is a simple English version of Wikipedia, designed specifically to have simple English words and grammar for people learning English and for children. Thank you Zahraa! 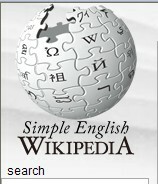 This is the URL http://simple.wikipedia.org/wiki/Main_Page or click here. This is a good place for teachers to contribute kid-friendly info for projects – and if you do become a contributor, well, you’ll know straight away if the work’s been plagiarised, eh? Goodbye Mr Chips – and good riddance! It’s a slender book, only 128 pages long and written a long time ago in 1934. 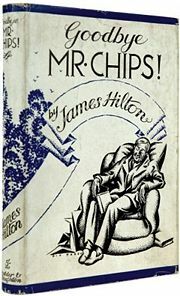 It made James Hilton’s name as an author, was reprinted countless times and has been adapted for screen and stage, most notably in the 1939 British classic but also more recently as a TV series in 2002. …a good school of the second rank. Several notable families supported it; it supplied fair samples of the history-making men of the age – judges, Members of Parliament, colonial administrators, a few peers and bishops. Mostly, however, it turned out merchants, manufacturers and professional men, with a good sprinkling of country squires and parsons. It was the sort of school which, when mentioned, would sometimes make snobbish people confess that they rather though they had heard of it. Chips answered, slowly and with pride: ‘For that matter – umph – they are the same as when your predecessor – Mr Meldrum – came here, and that -umph – was thirty-eight years ago’…..
And what does this ‘noble’ character do, when confronted by a headmaster asking him to improve his performance? He refuses to discuss it, refuses to resign, and uses his influence with one of the Old Boys to ignore Ralston! The class roars with laughter at this, something I hope would not happen today. Any teacher who tried to get his laughs by mocking a student and his family like that would be reprimanded by his principal these days, and we teach children not to tolerate this kind of bullying no matter where it comes from. Mr Chips, far from being a model of good teaching, is a failure. He’s a bully, and a bore, and no amount of jolly scones and tea can make up for the fact that he was hopelessly old-fashioned and wouldn’t make any effort to move with the times. He represents the kind of arrogance still occasionally met in the profession, when individuals think that they alone know how to teach and reject research-based evidence that there’s a better way. Goodbye Mr Chips may in its day have represented a more humane kind of teaching than its Victorian predecessors, but today it is an interesting museum piece, and that’s all. http://www.youtube.com/watch?v=9Lau_ROXbog if the site is blocked by your ISP. Posted in Book Reviews, Learning and teaching | Tagged: Goodbye Mr Chips by James Hilton | Comments Off on Goodbye Mr Chips – and good riddance!